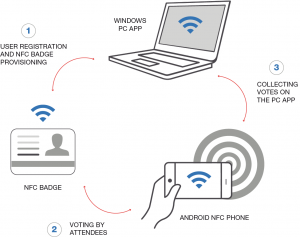 NFC voting system for poster session, based on NXP's NTAG 216 and FAMOCO mobile readers. ISPSD Conference organizers wanted to increase participation in the poster sessions and boost idea exchange among conference participants, allowing them to vote for their favorite posters, using the NFC-enabled conference badge. There were many challenges in implementing such a solution, but we endeavored to interfere as little as possible with the available registration and badge delivery system. We also worked to integrate our soultion on a large scale with the poster session equipment and material. We especially wanted to make voting easy for conference attendees. We took the aforementioned challenges into account when we defined the complete system architecture. The NFC-enabled badges included an NFC tag coded with a specific NDEF message containing the participants contact details. We developed and deployed an Android-based mobile application in FAMOCO mobile readers available at every poster station. We configured each mobile reader to register the votes for that particular poster. Participants had to tap their badge against the mobile reader and cast their vote for the selected poster. Once the poster session finished, the system administrator collected all the registered votes and processed them on the central PC. The PC application processing the votes allowed us to extract several indicators, which, of course, included the most popular poster. In addition, the fact that the conference attendee’s badges contained their contact details in an NDEF format allowed them to exchange their personal info by just tapping their badge against any NFC-enabled mobile device. We deployed the system on-site and provided support to the conference organizers during the event.